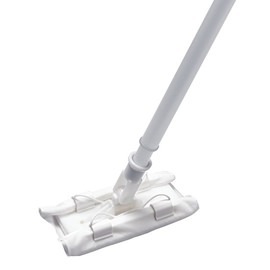 ClipperMop™ cleanroom mops are designed to use standard 9" x 9" and 12" x 12" cleanroom wipers, eliminating the need to qualify and inventory additional wipers or mop covers. Available in 2 options: 7" mop head and 11" mop head. The patented mophead utilizes non-abrasive polyethylene clips to securely fasten one or multiple wipers to the head. The ClipperMop wiper attachment method does not release particles, fibers and dirt. The mop system may be sterilized by gamma irradiation, chemicals, vaporized hydrogen peroxide (VHP) or ethylene oxide (EtO). For more product collection information check out our ClipperMop Sell Sheet or for an expanded list of mop cover / cleanroom wiper recommendations, see our Technical Data Sheet.